This is not a joke, nor some kind of doggie fashion statement! 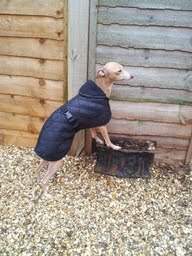 It is essential that you are able to keep your Italian Greyhound warm on walks in cold and wet weather! Most homes have central heating nowadays so indoors is generally not a problem. So what does your Italian Greyhound need in its wardrobe? We recommend at least one jumper or body warmer and one waterproof rain coat. The unusual size and body shape of an Italian Greyhound makes it difficult to find jumpers and coats to fit the breed in standard pet stores. A jumper which is completely the wrong shape won’t do much to keep your dog warm. However there are a large number of companies and individuals who make Italian Greyhound clothing – just search on the Internet for “Italian Greyhound Coats” or “Italian Greyhound Jumpers”. 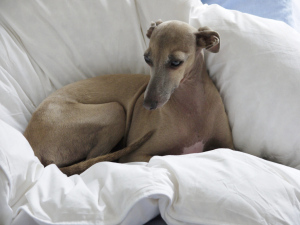 The Italian greyhound club have there own stall at shows selling coats, collars and beds made by member of the club . If you are having difficulty finding what you need for your dog then just contact us as we can always post items out to members. Italian Greyhounds like their creature comforts – most will look at you with a forlorn expression if you even suggest going outside in the rain. However with a warm jumper and a good rain coat there is no reason at all why they (and you) should not walk whatever the weather!